A mean old SOB in Dalton builds an explosive device, loads his SUV with fuel and becomes what the ATF calls a suicide bomber. He targets a downtown law firm. The device explodes, killing the bomber and badly injuring a lawyer. WXIA heard this, then made a remarkable decision. WXIA decided not to send a crew to Dalton. It’s wrong in light of this: During Ted Hall’s 7:30pm hit in the “information center” (as opposed to “news room”? ), Hall began his report on the bombing by exclaiming “this is really something.” He was right. Hall knew something that the managers who make assignments overlooked. It was the most interesting local news story of the day. Hall voiced over video that appeared to have been fed from a Chattanooga station. WXIA repeated the exercise in its Saturday newscasts. WXIA’s decision was also wrong in light of this: While WSB, WAGA and WGCL had reporters live in Dalton producing lead stories on the bombing, WXIA led at 11 with a very feature-y Keith Whitney piece on the BET hip-hop awards. At 7:30, WXIA led with a Denis O’Hayer story about teacher pensions. By comparison, the station looked dumb. Both of those guys should have been in Dalton. Had it sent a crew to Dalton, it would have seen quite a story unfolding. It might have gotten the same chilling interview WGCL’s Renee Starzyk got with a neighbor of the bomber, who described his hard-headedness and instability. Or it might have gotten the interview WAGA’s Tony Thomas got with a woman who was working in the office when it happened. For Atlanta TV, covering this story was a no-brainer. What was WXIA thinking? Dalton is 80 miles away, part of the Chattanooga ADI. The bomb didn’t go off in Atlanta’s back yard. Perhaps WXIA decided it wasn’t a “local” story. But the producers of its newscasts obviously thought otherwise, giving the story high play, while relying on video from a station in the nation’s 86th largest market. Perhaps the bombing didn’t sync with WXIA’s apparent effort to produce a somewhat brainier newscast. We’re all for that. But this was no garden-variety breaking news story. You can’t just ignore a suicide bomber in the North Georgia mountains, and hope to retain your credibility. This entry was posted in WAGA, WGCL, WXIA on October 19, 2008 by live apt fire. From what I hear, a WXIA photographer who lives in Cartersville was going to go… but WXIA recently instituted the policy that photographers must keep their equipment and vehicles at the station at night, instead of driving station photog vehicles home each day. The photographer was called and he said “sure, I’d love to cover it. Let me just come to the station and get my stuff.” It is believed that, after that, the station just said “the hell with this”. Brainier in-depth stories are fine, but when crap like this happens, I’m sorry, but WSB’s “swarming all over it like flies on turds” mantra does have some merit to it. Gas leaks, apartment fires and traffic jams are a dime a dozen, but law firms just don’t explode every day. Yewah …and if WSB is so good how come they were a little late to the scene. With an ADI as huge as Atlanta’s…and all the other station’s having take home vehicles… the Gannett decision won’t hurt the stations in Columbia/Macon/Knoxville as bad as WXIA. The new world of news that is cutbacks..maybe nationwide… but from what I can tell… WSB and WAGA are covering the news like it still was 1997. The term ADI is no longer used. It’s been replaced by DMA, or Designated Market Area. It does mean the same thing, though. But hey, I still like to say Vidifont and they haven’t made that wonderful character generator in years. and WGCL covers it, does any one see it? 5. “ECISYF” everyone called in sick Youre F*cked! When does WXIA ever think? At one time in the WSB newsroom, the WXIA id tag under a monitor for them in the bank of montiors was turned upside down. They’ll never get it right. 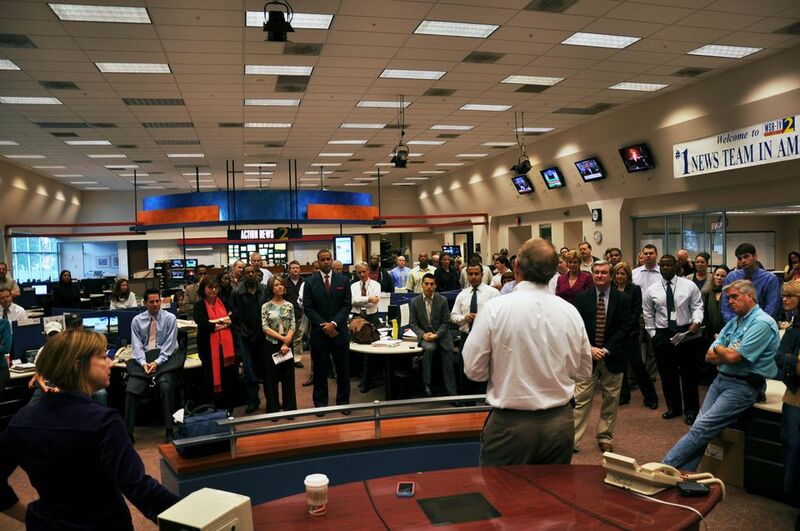 c’mon … i’m glad i was never in charge in a newsroom. it’s so much easier to sit back and laugh.